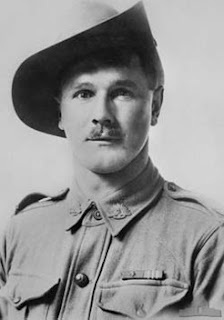 A COMMEMORATIVE service and morning tea will be held at the Maydena RSL Club tomorrow (Sunday) at 10.30am to mark the 100th anniversary of local man Percy Statton being awarded the Victoria Cross. The highest award in the honours systems of Australia, Great Britain, Canada, New Zealand and other Commonwealth countries, the Victoria Cross was presented to Sergeant Statton at Buckingham Palace in June 1919. Sergeant Statton, who had enlisted from the Tyenna Valley and returned there after World War I, had already received the Military Medal for bravery in an earlier action. Then in September 1918 it was announced he had been awarded the Victoria Cross for his actions on August 12, 1918. The announcement read that King George V had approved the award: "For most conspicuous bravery and initiative in action when in command of a platoon which reached its objective, the remainder of the battalion being held up by heavy machine-gun fire. He skillfully engaged two machine-gun posts with Lewis gun fire, enabling the remainder of his battalion to advance. "The advance of the battalion on his left had been brought to a standstill by heavy enemy machine-gun fire, and the first of our assaulting detachments to reach the machine-gun posts were put out of action in taking the first gun. Armed only with a revolver, in broad daylight, Sergeant Statton at once rushed four enemy machine-gun posts in succession, disposing of two of them, and killing five of the enemy. The remaining two posts retired and were wiped out by Lewis-gun fire. "Later in the evening, under heavy machine-gun fire, he went out again and brought in two badly wounded men. Sergeant Station set a magnificent example of quick decision, and the success of the attacking troops was largely due to his determined gallantry." The public is invited to attend the service at the Maydena RSL at 10.30am. A special guest will be Percy Statton's great-granddaughter Kerri and members of her family. The event marks the 100th aniversary of the day Sergeant Statton's bravery and initiative earned him the Victoria Cross.